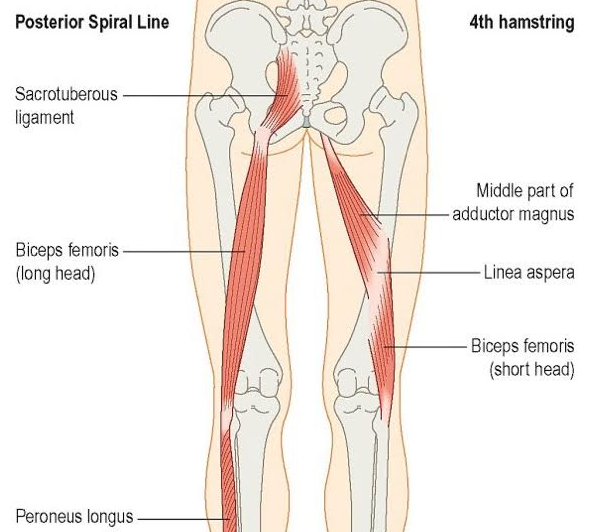 The adductor magnus is both an adductor and a hamstring muscle. The adductor magnus is the largest adductor muscle on the inside of the thigh. Yet we really shouldn’t think of it as one muscle at all. It has TWO parts, originating from two different origins, supplied by two different nerves and providing two different functions*. It is most commonly known as a powerful adductor muscle, pulling the leg back into midline from an abducted position. However, what we often don’t talk about is its role as a hamstring muscle. The second portion of the adductor magnus originates from the ischial tuberosity, alongside the hamstring muscles: biceps femoris (long head), semimembranosus and semitendinosus. This portion of the adductor magnus is supplied by the sciatic nerve, the same nerve that supplies the hamstring muscles (as compared to the pubofemoral portion, which is supplied by the obturator nerve). What fires together, works together. It then inserts into the lower part of the thigh bone, where it blends into the MCL (medial collateral ligament). Your adductor magnus is a hip extensor, just like hamstrings, particularly when the hip is in a flexed position! In a position of hip flexion, it is a more powerful hip extensor than glutes or hamstrings, which tend to increase activation as the hip approaches neutral and the extended position. This may be why you feel your adductors fire off to get you out of a deep squat position. It is the ONLY adductor muscle that is also a hip extensor; the rest flex the hip. Your adductors may be tight if you aren’t using your glutes properly, just like we see a lot of hamstring tension for the same reason. Perhaps what you need to release isn’t your hamstrings, but your adductor magnus! Perhaps adductor magnus tension should be assessed in conjunction with these muscles too! If your straight leg raise is limited, perhaps it’s because of your adductor magnus being tight. Assess here before you just start torturing those other hamstrings with the roller. If you have a history of MCL sprains or tears, perhaps you should also check this muscle for dysfunction, given its fascial connection with the longest portion of adductor magnus. It may affect your ability to stabilize yourself on one leg. That’s sort of important for any running or jumping sport. Stop thinking it’s always hamstrings. It’s not. Sometimes it’s the hamstring portion of an adductor muscle. Respect the anatomy and start assessing better. * Some would even divide it further into THREE parts: the middle and distal parts both innervated by the sciatic nerve as opposed to the upper part innervated by the obturator nerve. The middle part attaches to the linea aspera (back of the femur) where it BECOMES the short head of biceps femoris- hence the connection as the 4th hamstring muscle. The longest portion blends into MCL at the knee.